Given my background as a community organizer, my first writing that was directed to the public was on flyers—this in the days way before them internets and email—rallying people after a questionable police shooting or the use of the batterram (infamously sung about by Toddy Tee back in the day), this assault vehicle with a battering ram sticking out its front then L.A. police Chief Daryl Gates, the man who created SWAT, used to literally bulldoze into people’s houses in South Central usually in the pursuit of a couple of reefers and maybe an ounce of coke. Granted these were galvanizing issues, but to see folks come out, some of them holding a flyer I wrote and often designed, well that was powerful. When I finally made my first fiction sale some years later, a short story, I didn’t do anything in particular other than worry how would I make my next sale. Tell us about your process: Pen, paper, word processor, morning, noon, night... how do you write? I’m a nut for these rollerball, liquid ink sort of pens, the thickest line size I can find. I make notes—I have lost all ability to write cursively save for my name so I block print—on yellow legal pad paper. And by that I mean I start writing out a thought, then segue to something else, than back to the main point. I’ll draw arrows, write in the margin, draw a box around some word or phrase, number items and so forth shaping the main idea and getting the plot and characters organized. From that, I’ll compose a more coherent outline on the computer. I’m totally a morning person. Usually up by 6 a.m., make the coffee, answer some e-mails, then hit it. My usual count when on deadline for a day is 1,200 to 1,500 words. If I make that in three hours, cool. If it takes 5, 6, 7 hours, so be it. When I’m writing a comics or other kind of script I try to grind out 5-6 pages a day. I’d be terrified to have a drink with Parker as that’s probably not an outing I’d be returning from. I would say the Silver Surfer, but as this is a mystery readership, I’ll say Lew Archer, the man who his creator said if he turned sideways he’d disappear. Archer is clearly a well-read and well-traveled man who has keen insight into the human condition. He excels in deflecting when you ask him a question about himself, but I figure a couple of belts of Macallan 25s in him, he’ll get to pontification on the state of the world. I mean, his take on Trump would be, you know, hilarious in a sardonic way. What's the best piece of writing advice you've ever gotten, or that you can pass along? Kill you darlings. Was that Hemingway who said that or Dorothy Parker? Okay, wait I looked it up, seems it was Faulkner then expanded by Stephen King. Damn sound advice. Blind Man with a Pistol by Chester Himes. In this novel half way through, Himes pretty much jettison’s the plot, one of his last Coffin Ed Johnson and Grave Digger Jones cop novels, to riff on race and crime and anything else on his mind. Yet weaving his words and his off-kilter magic, it all kind of makes sense when he winds it back to the plot in the last few pages. Post modern before such was in vogue. Brown Acres: An Intimate History of the Los Angeles Sewers by Anna Sklar is a nonfiction book that covers the subject matter in detail as the title suggests. I love book like this about like how the paperclip got invented, how the pursuit of salt affected sea travel, colonization and what have. These things we take for granted that actually had an impact on society—and the often singular characters involved in these histories. A parable for the detective story if you like, how one event or invention leads to others, sometimes unrelated to the original device or happening. Think of of the book as a kind of continuation of the tale told in the movie Chinatown. S.H.I.E.L.D by Steranko, The Complete Collection graphic novel collects the relatively brief but influential run on the old Nick Fury, Agent of S.H.I.E.L.D. (the precursor to the Agents of S.H.I.E.L.D. TV show) Marvel comics series. This was a secondary feature shared with Dr. Strange in the Strange Tales comic, by artist-writer Jim Sternako. Even today, the wild, phantasmagorical approach Steranko took to what was a second tier character—Nick Fury was created by Stan Lee and Jack Kirby, at first an unshaven, cigar chomping Irish-American guy who grew up in Hell’s Kitchen, the WWII Sgt. Fury and his Howling Commandos, who gets reinvented and promoted during the ‘60s spy craze as Colonel Fury, head of a super secret law enforcement organization. Flying cars, killer robots, his old Nazi enemy Baron von Strucker running around with something called the Satan’s Claw… crazy plots that were an excuse for Steranko’s dynamic art and experimental panel layouts. Let your mind get blown. 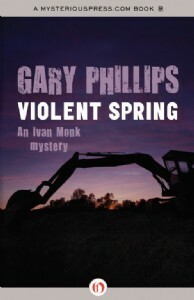 In addition to his Ivan Monk PI books from Mysteriouspress.com, Gary Phillips latest includes two comics projects, Vigilante: Southland and Peepland.